Mariners Latest: Kevin Millwood, Veter-in or Veter-out? Kevin Millwood, Veter-in or Veter-out? Jack Z's latest addition to the "We'll sign you to a minor league contract with an invitation to Spring Training" club. Kevin Millwood. Millwood has a career 4.10 ERA with a 163 - 140 win/loss record, the 37 year old right hander is a workhorse, averaging 208 innings pitched. Millwood last pitched with the Colorado Rockies and made just 9 starts for them, holding a 4 - 3 record with a 3.98 ERA and a 1.215 WHIP. Millwood is expected to have better success in a pitcher friendly park such as Safeco Field. He's had multiple years of tremendous success throughout his career with the Rangers, Phillies and Braves. I assume that he will make the starting rotation out of Spring Training as the Mariners have been looking for a veteran presence to compliment the youthfulness of their pitching staff and Millwood makes sense, especially at a low cost. Kevin Millwood is another Scott Boras client and the latest signed by the Mariners. While we await the signing of Prince Fielder, the M's seem to be licking the Boras plate clean for him in hopes to sign the free agent slugger. As Spring Training quickly approaches, the Prince still is without a home. We haven't heard many rumors regarding Seattle being a landing spot, but we know through the other signings this off-season that the Mariners have had many talks with Scott Boras. 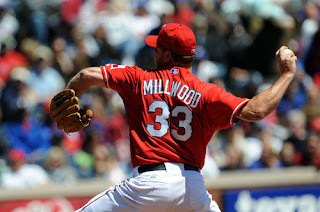 We welcome Kevin Millwood and wish him success in his new ballpark. In hopes that he returns to the form he had with Texas or even more so, the Braves where he was voted 3rd in the Cy Young Voting and 2nd in NLMVP votes. That was way back in 1999, so that may not be a realistic notion, but hey, just how much does Safeco Field help these pitchers? I guess we'll have to wait and see. Veter-in, Millwood coming off a better year than he had for the Orioles in 2009 where he went 4 and 16. The Rockies were looking to have him back but Millwood declined a 1 million dollar deal to remain there. Safeco presents a much better opportunity for him to revamp his career. Veter-out, at age 37, his ship could have sailed. We could be looking at another aged player that just simply cannot get it done at the Major League level anymore. Jack Z continues to dig and dig and dig to find that diamond in the rough.